Vintage Hardback World Landmark Cloth Cover with Dust Jacket and Author Letter. Book itself is in Excellent condition with a tight binding and clean crisp pages. Inside text appears to be unread and unused. Book also includes the Near Mint Author Letter folded in the original trifold that was provided to members of the "Young Readers of America" club. Outside cloth covers are very nice with some minor corner wear. Book has come from a private collection. Dust Jacket is in Very Good Plus condition with some minor chipping to the top and bottom of the outside spine. Dust Jacket is now covered by a new clear mylar cover. Landmark Books and World Landmark Books are accurate, in-depth stories for young people in the 9-15 year old range. These living histories were written by award-winning authors or by men and women who experienced the events first hand. Written during the 1950's and 1960's and illustrated either with two-color drawings or clear photographs, the books are informative, enjoyable, and well worth reading and collecting. World Landmark Book #11. In 1095, the world was very different from our world today. For those were the days when knights rode forth to battle in heavy armor, and miitary might determined all things. In that year Peter the Hermit led thousands of men, women, and children in a march to Jerusalem to rescue the Holy Lands from the Moslems. Each of his followers wore a cross as a sign of membership in what was called the First Crusade. In the next 200 years, millions of Europeans headed toward Jerusalem on a series of crusades. Some of the Crusaders kept journals from which we can piece together the full story of there adventures. 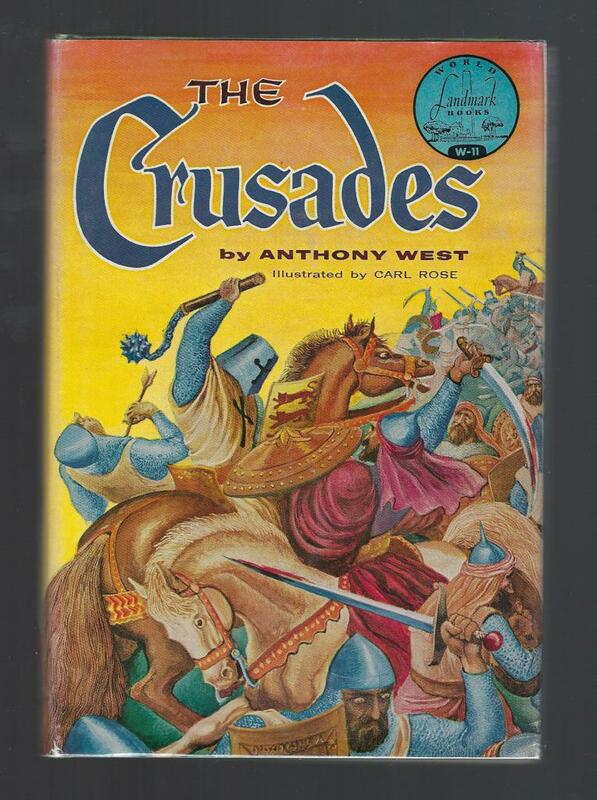 In the Crusades, Anthony West recounts the extraordinary events of those expeditions. A classic in a wonderful series!